1How do I know what temperature water to wash my FR clothing in? To minimize shrinkage, Tyndale recommends laundering garments at a “warm” temperature. It is best to line dry an FR garment or tumble-dry on low to minimize shrinkage. Remove the garment from the dryer while it is still damp. For heavily soiled garments, wash in the hottest temperature allowed on the care label (generally warm setting) to remove dirt. FR garments can be dry-cleaned any time. 2What laundering options does Tyndale offer? Is it better to have an industrial laundry provider or to home launder? Tyndale will work with your company to analyze costs and benefits of different laundering solutions. In our experience, home laundering ensures longer garment life and greater convenience. Industrial laundering may be the best option for workers whose garments are severely soiled. Each company has unique laundering needs, and Tyndale will work with you no matter what your laundering needs are. 3Can I use bleach to clean my FR clothing? No, you should not use bleach when laundering FR clothing. There is data to suggest that bleach can degrade the FR characteristics of the fabric and reduce the protective properties of the garment. To maximize your safety you should launder FR clothing without using bleach. 4Can I wash the “flame resistance” out of my clothing? The chemical properties of flame resistant clothing manufactured by Tyndale cannot be washed out over time if the washing instructions are followed, using Liquid Tide or Liquid Tide HE for best cleaning performance. 5How do I keep my garment from shrinking? Two-thirds of a garment’s shrinkage takes place within the first five washings. Once you are happy with the way your garment fits, you can retain its size, like any other garment, by line drying instead it of using a dryer. If using a dryer is necessary, tumble dry the garment on low. Drying a garment on high heat may shrink it excessively. 6Can I predict how much my garment will shrink? Flame resistant fabrics, like many non-FR fabrics, are susceptible to shrinkage no matter what company makes the fabric or who manufactures the garment. Below, Tyndale has provided shrinkage approximations of all Tyndale-manufactured garments after 50 launderings. Tyndale manufactures all garments to help accommodate future shrinkage. Ultra Soft® Knits - 4"-5"
Ultra Soft® Wovens - 2"-2.5"
7How do I know when it’s time for a new FR garment? 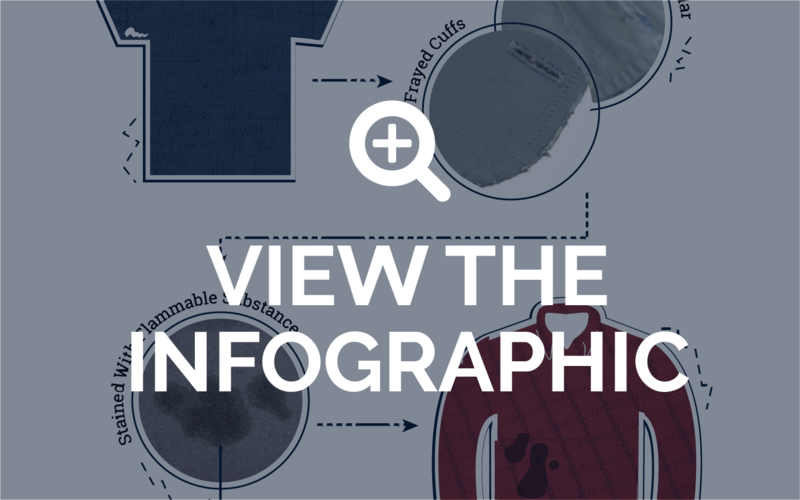 the garment is stained with a flammable substance that cannot be removed through laundering. the garment has had contact with bleach. 8Is it safe to apply insect repellent with DEET to my flame resistant clothing? Tyndale does not recommend applying insect repellent with DEET to FR under any circumstances. In lab testing, insect repellent with DEET (N,N-diethyl-meta-toluamide) was applied to an FR shirt per insect repellent label directions. The result indicates that a shirt treated with DEET or insect repellent with DEET propagates the flame after an arc and can contribute to body burn in the event of electric arc. Insect repellent products with DEET as an active ingredient should not be used on flame resistant products. For garments that have been improperly sprayed with DEET or insect repellent with DEET, the DEET can be removed by following the manufacturer’s home laundering instructions. The DEET on the surface of the fabric masks the flame resistant properties of the fabric. When applying insect repellents to garments, a waterborne Permethrin based insect repellent has been shown in testing to not have an adverse effect on flame resistance. Tyndale manufactures a line of garments pre-treated with Permethrin Insect Guard™, providing a safe, simple way to prevent annoying insect bites while working in the field. Feature FAQ When Should My FR Be Retired From Service? View Our Latest Infographic for the Answer!